For those of you buying the Sarin attack is a false flag hoax, the Trump Administration is declassifying the evidence from whence sarin was loaded at Shayrat Airfield on Su-22 fixed-wing aircraft. Flown over Khan Shaykhun and released on the civilian residents. There is even the appearance that – SURPRISE – Russia and Iran has spreading disinformation about the sarin attack. This would be where conspiracy theorists have picked up false flag data and then proceeded to spread the Russian/Iranian propaganda. The above quote is from PJ Media article that I am cross posting below. WASHINGTON — White House officials said today that the U.S. has amassed a mountain of evidence confirming that Syrian President Bashar al-Assad used sarin against the town of Khan Shaykhun last week, and indicated they’re still trying to determine if Russia knew about the attack beforehand. A declassified summary of the intelligence report on the attack that killed dozens and injured hundreds one week ago today found that the Syrian and Russian assertion that the nerve agent must have come from terrorist or rebel forces also has no basis in fact. New information coming in “continues to be clear and consistent with our understanding of the attack,” a senior White House official told reporters on background today. The declassified information was compiled from open-source materials ranging from videos to on-the-ground accounts, geospatial intelligence, U.S. signals intelligence, and physiological samples from attack victims. The attack came from Su-22 fixed-wing aircraft out of the Shayrat airfield hit in subsequent U.S. strikes, the report says; the planes were in the Khan Shaykhun area for 20 minutes before the first report of a chemical attack came in, and left soon after. The administration also has “information that suggest that personnel historically associated with the chemical weapons program were at Shayrat airfield in late March preparing for this attack,” and these people were there again on the day of the attack. The U.S. has confirmed the agent used in the attack was sarin, from testing on the victims and from symptom reports as well as “leakage around the actual weapon that we think the sarin came from.” Emergency personnel suffered exposure symptoms from coming into contact with contaminated victims. A hospital treating attack victims was struck by conventional weapons about six hours after the chemical attack. On hoax theories, the White House official said the “absolute massive data we have in all the different vehicles — we’ve gotten it from open-source videos, to victim accounts, to imagery, to signals intelligence, is just too massive for really any — any intelligence organization to fabricate in that short a period of time; we just think that’s not a feasible explanation.” Intel agencies have confirmed that videos distributed of the attack were filmed at the time and in the locations claimed. “Across the board starting in 2013 [with the Ghouta sarin attack] and then since, we’ve seen both the Russians and the Syrians have a very clear campaign to try to obfuscate the nature of attacks, the attackers, and what has happened at any particular incident,” the official said. 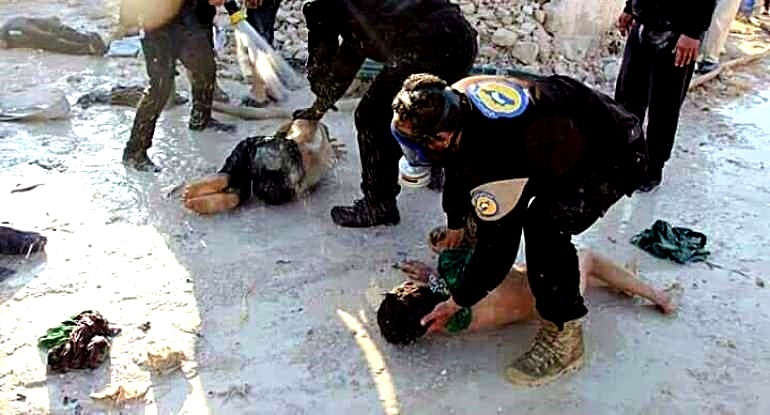 The official added that the Russian theory that a conventional regime strike hit a chemical weapons depot is “inconsistent” with the facts, stressing terrorist groups or rebels are not known to have sarin and “we don’t see a building, again, with that chemical residue we would expect if the Russian narrative was true.” The chemical weapon landed in the middle of a street. It’s “quite clear to us, that in this case, this is not a terrorist holding of sarin, or a terrorist use of sarin, but we do know that the Syrian regime has sarin,” the official said. The officials would not comment on the existence of any U.S. signals intelligence that would indicate collusion between the Russians and Syrians or a direct order from Assad to attack the town. Officials theorized that the chemical weapons strike was conducted because, even though a civilian neighborhood was the target, Khan Shaykhun was one of the support areas in the rear of the opposition front lines advancing on Hama since March. The city includes a key airbase for Assad’s forces. “At that point, the regime, we think, calculated that with its manpower spread quite think trying to support both defensive operations and consolidation operations in Aleppo and along that north-south spine of western Syria, and also trying to support operations which required it to send manpower and resources east toward Palmyra, we believe that the regime probably calculated at that point that chemical weapons were necessary in order to try to make up for the manpower deficiency,” an official said. Copyright © 2005-2017 PJ Media All Rights Reserved. Since its inception in 2005, PJ Media has been focused on the news that matters — from the insightful commentary provided by our all-star lineup of columnists to our writers’ quick takes on breaking news and trending stories. The media company’s founders — Academy Award Nominee Roger L. Simon, Charles Johnson (Little Green Footballs) and Glenn Reynolds (Instapundit) — brought together a tightly knit band of bloggers into an integrated website that has evolved into a reliable source for original, unique, and cutting-edge political news and analysis. We’ve been there through primaries and general elections; the U.S. border crisis; doctored climate change data; the gunrunners’ scandal; Department of Justice voter fraud and the Ground Zero mosque — stories that others in the media initially passed by. As a company, we’ve always felt a special connection to the values which make America special, as well as a dedication to keeping America great for our children and our children’s children. That’s why our main focus is on the three main areas that will have the most impact on the future of America: politics, parenting and lifestyle.